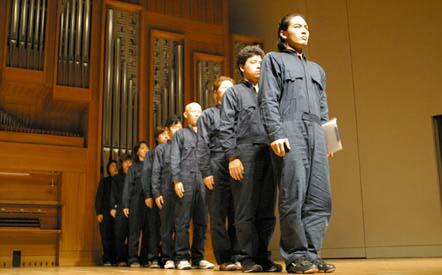 performance since call for members of "The Method Machine"
JOhnson Tom, NAkazawa Hideki, MAtsui Shigeru, MIwa Masahiro. works" or "a machine which realizes ideas of artists." Software Section" were exhibited in the entrance lobby. same program we could get big audience and good resonances. "basislessness" behind them at the same time. debut event at "SCAI THE BATHHOUSE" on the 5th of December. Method Machine" realizes with its human bodies. originated from the same sigle row of letters. cf. Please see also "The Same Two Frames No. 1 - 10"
Thousands" appeared in "METHOD NO. 37." From "The Computing Bodies." October 16, 2004.
comment on this performance as one of the performers. garish colored works before "Methodicism" and "Baka CG." made of the largest number of coins I have ever used.